Checking Out The International Food Fair! Hey bunnies! Video post today. I headed on out to MadPea’s International Food Fair to walk around and check out the sights! The Fair ends on the 4th, so you REALLY need to head on out there because there is just TOO much cute!! If you love food and food themed items, this is the place for you! Plus, you’ll be doing a good deed and helping to raise money for Feed A Smile so they can build a new kitchen for a school in Kenya! Check out the video, and then check out the Food Fair! Hey bunnies! If you haven’t been to Rewind yet, you need to GO. Quick quick! Back in the 90s, I was absolutely into slip dresses with baby tees underneath! So I was super thrilled with the Iha dress from Vinyl for Rewind! The only thing that would have made this dress more “Me in high school” would be if the shirt underneath had a small smiley face or daisy patch! Decoy‘s Jelly Heels are such a perfect match for this dress, too! And of course, no 90s outfit is complete without a choker, like the Mood Stone Velvet and Flower Lace chokers from Izzie’s! Rewind closes on the 28th, so be sure you head out there this weekend! Hello bunnies! Guess what?? MadPea’s International Food Fair starts today at noon!! I am so so excited about it! 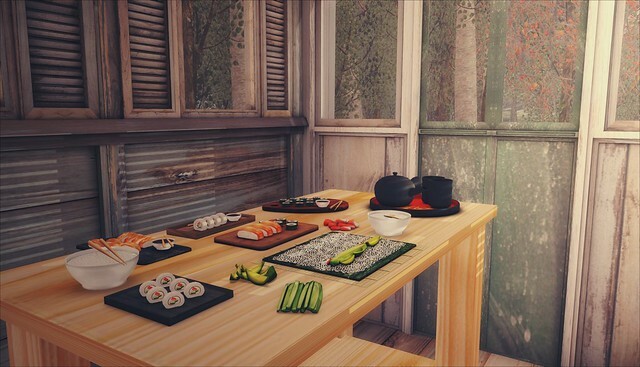 I absolutely love food in Second Life, or food themed items, and the Food Fair has a great mix of both. The International Food Fair is also a charity event! The money raised will be going to Feed A Smile, and the goal this year is to raise enough money to build a kitchen for a school in Kenya. You can read all about it on the website and keep up with how much money has been donated so far. AND you can read the schedule because this isn’t just a shopping event! There are at least two live performances daily! It really is going to be a wonderful event, so be sure you make it out there and get your eats! Is This Like A Noxema Commercial Or What? Hello bunnies! Well, this past week has been fun. I’ve had, if not the flu, then something incredibly close. It has wiped me OUT. So naturally, I’m behind on every life. *laughs* I feel horrible about it, but all I’ve wanted to do is rest, and I probably needed that more than anything. Rewind has started!! This is a throwback to the 90s, my FAVORITE decade! Today I styled myself after Cher Horowitz from Clueless. I actually had an outfit very close to this around the time the movie came out, although mine was blue and orange. Yes, just as bright and nutty as it sounds. And I was also obsessed with smiley faces. I feel like this photo is SO me in high school. So so me. At least, for one of my phases. Oh yes, there were phases. Rewind is only until the 28th, so hurry on over and snap up your 90s goodies! Hello bunnies! I meant to do this video last week, but I’ve been pretty sick this past week and this was the first day I’ve really felt like sitting up and doing a video in a while. Lassitude & Ennui made the most beautiful wings for The Gacha Garden! The Seraphim wings are bento, so you DO have to be in a bento viewer in order to see them properly. But they are just lovely and move so so well! Video, pic, and credits today! I feel almost productive again! Hello bunnies! Well, February has been a flop for me so far. *laughs* I have been dreadfully sick this past week. I’d like to blame it all on an overly strong flu vaccine, but truthfully, I think I was just completely run down prior to getting it. I’m feeling a little better, not 100% yet, but there’s always time to be a girl. Most of what I’m showing today are from N21. If you haven’t been yet, you need to go go go!! It closes soon and you don’t want to miss out!